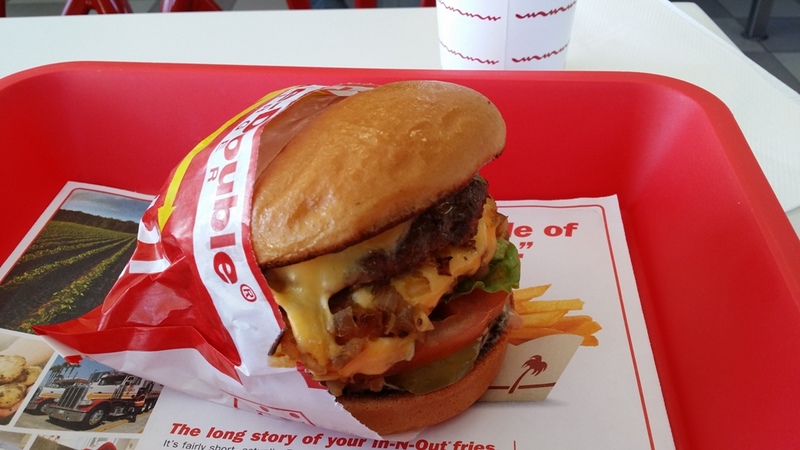 People and businesses are not the only thing that has moved in from the West Coast to Austin, but the infamous In-N-Out Burger has finally made it’s way to town after a stop in Dallas and Round Rock. The franchise with it’s signature red, white, and yellow coloring on surface seems like a perfect match for Austin with it’s secret menu and mention in the Coen brothers classic film and Austin favorite The Big Lebowski which undoubtedly surged the popularity of both In-N-Out and White Russians, but the franchise faces stiff local competition for the fast-food burger market. 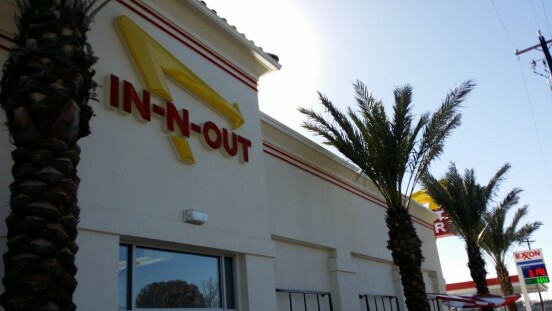 In-N-Out’s only current Austin location is located central at Airport and 46th street. Upon arriving it looks near identical to it’s other franchises if one has visited those around the country from the California based food chain. It features a long winding drive-through to back up cars in queue, palm trees have been planted around the building, and the inside is a drab grey contrasting with a bright red with near identical seating arrangements. The staff is very friendly and punctual and features the same 1950’s style attire and near identical ordering system as In-N-Out franchises I’ve visited over the years when travelling in California or the Dallas locations. The famed not so secret menu exists allowing one plenty of ways to customize your burger to your needs. Where things seem to fall short of the status quo though is in the food, unfortunately. It has been two years since I’ve visited it the In-N-Out in California, and six months since a stop at a location in Dallas, but something seems to be missing from the burgers here in Austin. Trying a double cheseburger and an Animal Style overall seemed just decent at best. The bun seemed not so fresh, the vegetables okay but not crisp, plenty of cheese and mess which is typical for In-N-Out, but something seems to be lacking overall in the beef. The flavor is okay, but lacks the punch overall in comparison to most of Austin’s best fast food restaurants with either burgers doused in a thousand island type dressing. Whether it might be a romanticizing of memories or the excitement of a vaction the overall quality compared to Austin’s own burger chains seems completely lacking. The most direct and logical comparison if of course Austin’s own P. Terry’s. Both feature small patty type burgers, an old school style decor and menu coupled with very friendly and better paid fast food workers than the majority of companies (In-N-Out starts at $10.50 an hour). Both are definitely very greasy burgers and with P. Terry’s one gets the option of a wheat bun, bacon, and features natural angus beef. The beef is where it counts and the quality doesn’t seem to match up quite well to the Austin based franchise now that it’s on it’s home turf. Unfortunately the fries fair even worse. While the burgers are okay, if not great, the fries are even more bland. Sampling the shakes though they seem much, much better but a shake is in it’s self something very hard to screw up. As of this writing there wasn’t much of a crowd or line so don’t worry if you do wish to sample the burger you won’t have to face the long lines that first appeared. So In-N-Out has now arrived in Austin. The hype might have faded, and it is a quality burger, but it’s hard to match up to P. Terry’s, Mighty Fine, Elevation Burger, and Whataburger when it comes to overall quality. I read this article and found it very interesting, thought it might be something for you. The article is called Those Are OK Burgers, Walter: In-N-Out Austin Reviewed and is located at https://www.austincurrent.com/in-n-out-austin-review/.